Thawing sea ice and improved technology is opening up the race for natural resource exploration in the Arctic Circle, home to nearly a quarter of the world's untapped oil reserves. Russia leads the race and has promised to adhere to environmental guidelines. But accidents and other damage resulting from the country's oil exploration tell a different story. The overwhelming reaction to news that Australia is to ditch its carbon floor price – in response to a push by business and as a condition to linking with the European Emissions Trading Scheme – has been one of relief. Surely, the argument goes, the carbon price must go down. The data continue to roll in, and they are telling us we are in the process of bringing an end to the world we evolved in, and creating a new, harsher world. We will be forced to devote more and more of our resources trying to adapt to this new world, and less on development. A world-leading Arctic expert has predicted the region's summer sea ice will vanish within three years. Big call? More like a call to arms. 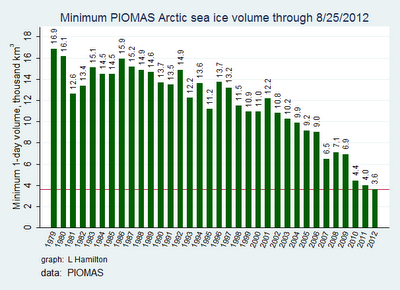 There's half as much sea-ice as there was 30 years ago and the annual summer melt keeps smashing records. Here's why Australian policy-makers should be paying attention. The sea ice is leaving us a bit more every year. It's time to start contemplating its absence, which is why I teamed up with Kevin McKinney to write an extended version of the shorter piece you might see pop up here and there. The Arctic is in crisis, yet all we try to do is profit from the disaster. In this week's issue of Nature a study lead by Stockholm University, with collaborators from Russia, US, UK, Switzerland, Norway, Spain and Denmark, show that an ancient and large carbon pool held in a less-studied form of permafrost ("Yedoma") is thaw-released along the ~ 7000 kilometer desolate coast of northernmost Siberian Arctic. Past transitions from glacial to interglacial climates have not been smooth. It would be wise to prepare for similarly sudden episodes of ice loss in future climate changes. Research scientists and other concerned academics should be more willing to join the climate change debate. How climate change science is conducted, communicated and translated into policy must be radically transformed if 'dangerous' climate change is to be averted. Climate scientists should learn from the naysayers and pull together to get their message across, says Chris Rapley. Shi Hongmin has been panic buying recently. Two enormous bottles of cooking oil and two 25-kg sacks of flour are just some of his purchases. Leading water scientists have issued one of the sternest warnings yet about global food supplies, saying the world's population may have to switch almost completely to a vegetarian diet over the next 40 years to avoid catastrophic shortages. US and eastern Europe sent food prices to a record high. Government reference group looking into health effects of wind turbines includes an “independent” expert who is actually an anti-wind farm campaigner. Germany's biggest utilities are shedding the conventional concept of baseload and peaking power, and replacing it with a vision of flexible and inflexible generation designed around renewables. Western Australia's emerging unconventional gas sector, which undertakes a practice known as fracking, will be subject to Australia's toughest disclosure laws. Residents at Fullerton Cove, north of Newcastle say they will continue their protest at a Coal Seam Gas test drill site despite police ending their blockade of an access road. The use of "smoky coal" for household cooking and heating is associated with a substantial increase in the lifetime risk of developing lung cancer, finds a study from China published on the British Medical Journal website. The man who helped Rupert Murdoch establish The Australian, Rodney E. Lever, feels some regret about a newspaper he says “remains the idiotic plaything of rogue amateur journalism”. Climate change is no longer the great moral challenge of our time or a great economic catastrophe; it’s just a bit of a policy bugger. Policy think tank Australia Institute says the Federal Government's decision to scrap the floor price on carbon is likely to lead to a hole in future budgets. Significant changes to Australia's pollution price announced today, following extensive negotiations between the government, the Greens and the European Commission, will deliver a big step forward for genuine action to cut pollution both in Australia and globally. The Gillard government has made a concession to big business and tweaked its carbon price, potentially creating a budget black hole and endangering incentives for the switch to cleaner energy. The price floor in Australia’s permit trading scheme will be replaced with a binding limit on CDM emissions credits, coupled with early linking to the EU emissions trading scheme, the Australian government announced today. Farmers in this hardscrabble patch of the Midwest know the discomfort of summer heat, they've suffered through dry weather before, and they've certainly lived through the boom and bust cycles of modern farming. But they've never season a drought like the one that's gripping much of the nation, and they're seeing miserable growing conditions rivaled only perhaps by the Dust Bowl days of the 1930s. Climate change mitigation commitments and basic carbon-cycle science both require reliable information on carbon dioxide emissions. Uncertainties in energy data and carbon dioxide emissions estimates are particularly important when they involve large emitters. Ice cores in the Antarctic have confirmed rainfall in eastern Australia over the past 100 years has been below the average for the past millennium. Many of the world's tropical protected areas are struggling to sustain biodiversity, researchers say.